I started working from home a month ago and I must say that it is an adjustment. I now have to share a work space with my hubby and I don’t think he is enjoying it. Neither am I. The only reason I ever used our home office before was to surf the net or print off a few random things (mostly coupons). I am now taking over and neither of us can stand it. So we have decided it is time for an office make over. Chris is building a 10 foot desk that spans one wall so we can both have a work space and hopefully stay organized. 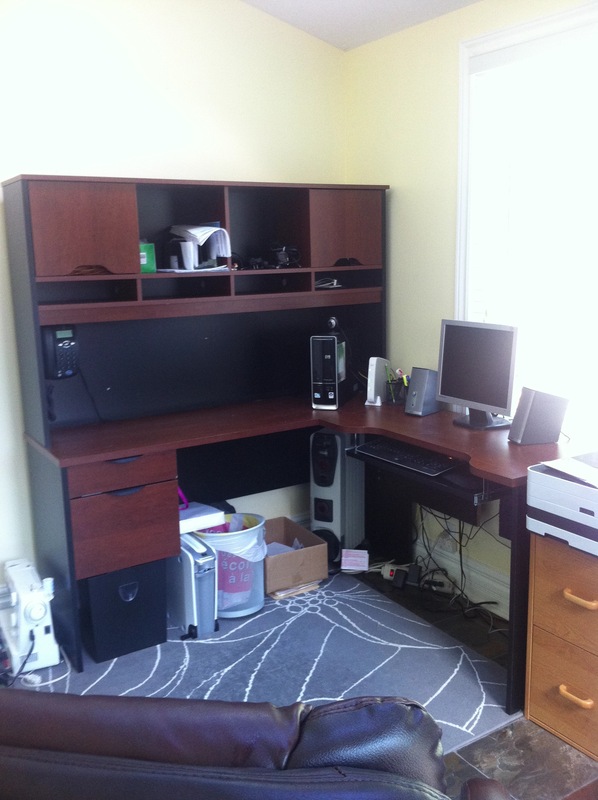 Here is how the office looked before. The desk was cleaned off so we could sell it online. Nice and cozy. It is actually quite awful. The stool is too tall for the child sized table and it is causing major back pain. Stay tuned for the office clean up and desk reveal. « What’s for dinner tonight? Sarah I just love reading your blog! Your recipes look so delicious and easy – I didn’t think that soft pretzels could be made at home but I will now give it a try. Now if only Glenn liked pecan pie!! Keep the blogs coming!